At Prairie View A&M, all eyes are on the new football stadium, which officials hope will not only boost the Panthers' stats but also ultimately raise enrollment for the small, historically black college for the first time in years. PRAIRIE VIEW — When the Prairie View A&M Panthers face off against the Texas Southern Tigers on Labor Day weekend, the game will be about more than just the teams on the field. 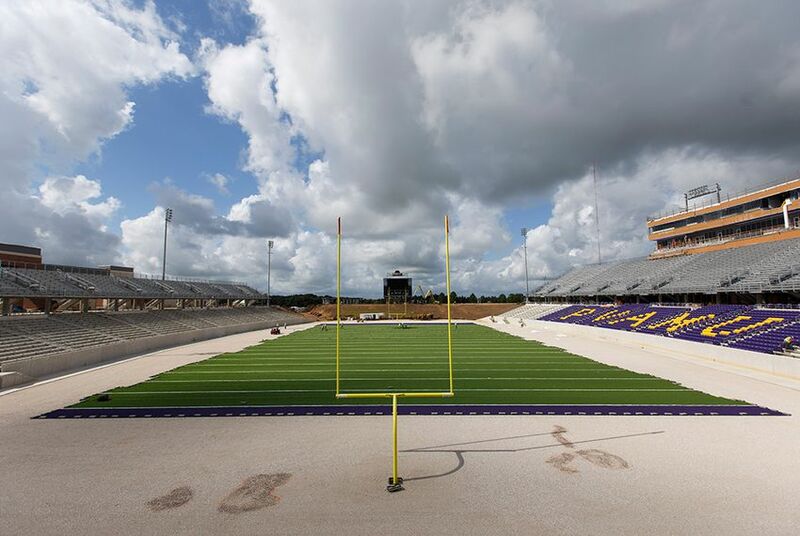 The match will be the first hosted in Prairie View A&M's new football stadium and field house, a $61 million facility that university officials hope to leverage to increase enrollment and elevate the identity of the small, historically black college. The new stadium, built on the grounds of former Blackshear Field, will feature 15,000 seats, along with 500 premium seats and 10 sky boxes. The new field house includes a weight room, locker rooms, a training area, a full kitchen and classrooms. The Labor Day weekend classic will be aired live on ESPN’s college sports channel ESPNU, university officials announced Wednesday. Roy Perry, president of the Prairie View A&M Foundation, said the new facilities and coverage on a national network will be useful in attracting more students — both athletes and fans — to the university. “We’re doing all this so students will give us a second look,” Perry said. With several large university systems nearby, including the University of Houston and Rice University, Prairie View A&M has struggled to compete for students. Founded in 1876, it is the second oldest institute of higher education in the state, but its enrollment has stagnated at about 8,000 students over the past several years. University officials say the football stadium will help boost enrollment along with other major facilities upgrades, including a new soccer stadium under construction and a recently renovated track stadium where the U.S. Olympic track team will train this summer. Head Football Coach Willie Simmons said the stadium is already attracting prospective athletes to the school. In the last two months, 25 high school football players visited the campus without outreach from the university, Simmons said. While donors have played a role in funding the new stadium, Texas A&M University System Vice Chancellor Phillip Ray said most of the credit goes to the students. Two-thirds of the $61 million budget will be financed by Prairie View A&M students through a student fee, an increasingly common practice among Texas universities to cover some of the costs of their athletics programs. Students approved the $175 per semester fee in a referendum vote in 2013. It was implemented in 2014 and may remain in place for up to 30 years. The fee will fund projects for all athletic programs at the university. In return, students can attend all athletic events on campus for free. The university is also trying to raise $25 million in donations over the next five years to double Panther Stadium’s capacity to 30,000 seats. For alumni, the stadium is a significant upgrade from the grass field many of them played on. Tim Smith, a former wide receiver who graduated in 2009, remembers how the old field would turn to mud whenever it rained. K.J. Black guided the Panthers to the Southwestern Athletic Conference championship as quarterback in 2009 and now works as a quarterbacks coach for the team. He said the school has always had a lot of pride in its football team, but he hopes the new stadium will showcase that pride to others. Disclosure: Prairie View A&M University, Rice University, Sam Houston State University, Texas A&M University, the University of Houston have been financial supporters of The Texas Tribune. A complete list of Tribune donors and sponsors can be viewed here.